In an age when length is dominating the consciousness of the game, the Leven stands as a testament to strategic principles. Whenever employed, it is among the most fun templates to play. An opportunity to dive even deeper arose when Architect Brett Hochstein (@hochsteindesign) visited Lundin Links, where Macdonald found his inspiration for the template. Brett graciously contributed a terrific field report. The original Leven, known to the Lundin Golf Club as “Trows,” is somewhat hard to figure out upon first sight. For starters, the green is barely visible behind a hill offset to the left, and only the top of the flag can be seen from the elevated medal (back) tees. From the left forward tees, it would not be out of question to think upon first glance that the hole plays to the nearby 2nd green on the right. It is this blindness though, along with a burn (stream) running diagonally across the landing area, that give the hole its unique strategy that would be replicated numerous times by Macdonald, Seth Raynor, and others. The aforementioned burn runs across the hole on a diagonal going from closer left to further right before curling up the right side of the length of the hole. This puts it much more in play around the ideal landing area, either punishing or rewarding the more aggressive play further down the right. A more conservative play short and left will result in a blind, often downwind shot over more of the grassy hill with no room to land the ball short. This is a great hole and one that would be fun to play on a daily basis, especially during a dry summer with a trailing wind, both of which would make the hill fronting the green exponentially more difficult to navigate. Even when calm though, the hole’s short length is offset by the burn, sloping fairway, and bunkers, which all make the ideal second shot landing areas effectively small and difficult to find. Play aggressively, and a punishment is likely. It is vexing on its own, but coupling that with the variable and often strong Scottish wind leaves you with a hole where you are very happy to run away with a 4. Macdonald’s Leven at NGLA, named Peconic, is his most artistic and arguably his most challenging. The hole plays downhill angling left to right. The fronting mound is exposed sand and hides a set of nasty pot bunkers. Chicago Golf’s Leven plays uphill with an angled bunker right along the aggressive line. The green on the 5th, with its internal spine and contours is not only one of the best at CGC, it is one of the best in golf. Raynor’s Leven at Yale swings left around a defended corner. Take on the fairway hazard to avoid dealing the hillside bunkering short right on approach. On the uphill 11th at Macdonald’s SLCC throws a wrinkle at players with the two bunkers up the right side ready to grab tee balls from players looking to gain an angle advantage. In true Macdonald fashion, the front left mounding has artistic flair. Blue Mound’s Leven is one of Raynor’s simplest designs tee to green with the entire left side of the hole open. The difficulty of this version is at the green. A subtle left slope feeds into the bunker and an internal spine makes lag putting tricky. Another artful Macdonald creation, the Leven at Mid Ocean sits in a small valley and works its way uphill to the right. The green is defended by mounding and bunkers that are as beautiful as they are penal. This under the radar Raynor gem is packed with soldi templates, including the Leven 12th. It plays along a side hill that feeds tee shots into a right hand bunker. That bunker must be challenged for the best angle into the benched green. The Leven on Raynor’s low country masterwork may be simple, but it’s not short on challenge. The 2nd plays to the left and then to a green with nuanced contours. A scoring chance, but no lay down. Camargo is where Seth Raynor’s most elegant templates can be found, including the Leven 14th. It plays up and over a hill and then swings down to the green right. A gaping bunker protects the front right of the green. One of the shortest Levens is also one of the most fun. Shoreacres 3rd plays straightaway with bunkers on both sides. The green is drivable with the right wind, but overzealous shots that miss the mark have difficult bunkers lying in wait. 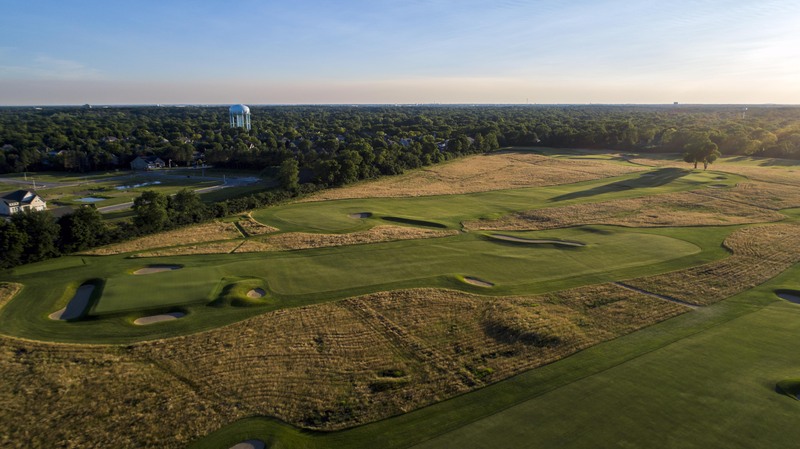 Tom Doak and Jim Urbina put their special twist on the Leven on their course inspired by C.B. Macdonald. The mound left of the green obscures shots from the right, but can also be used to feed balls onto the green. The Leven 5th at BGC is named Shipwreck for a reason. There are numerous ways to wreck a card on this shortie from Gil Hanse. Severe bunkers and mounding down the right must be challenged for the best angle into the extremely narrow green.